Grandview Calvary Baptist Church (GCBC) has cleared a major hurdle in realizing its dream of creating affordable housing in its Vancouver neighbourhood. Earlier this year, Vancouver city council unanimously approved the church’s re-zoning application to convert the church’s parking lot into a four-storey, 26-unit building to house low income and marginalized individuals and families. The $6.8 million project has been a vision held by GCBC for at least seven years and is part of a larger vision to live incarnationally within its community alongside the marginalized and those who face barriers to employment. “We are trying to create a place of welcome and doing it in a way that focuses on mutual transformation through interactions with people different than ourselves,” explained Johanna Suttor-Doerksen, Community Housing Director for (SCS), GCBC’s partner in the housing project. The four-storey building will be purposely built to include private units that share common areas such as a common kitchen, living space and gardening space. It will be segmented into six ‘pods’ where all apartment doors will open onto each other and will share a common area with couches and a balcony, as well as a laundry room. Most of the 26 units will be for individuals. Eighteen will be studio apartments, four will be one-bedroom apartments, and four will be two-bedroom apartments. Between six and eight of the units will be reserved for members of the Grandview Calvary community or another local church community, so they can live their lives alongside the other tenants and share their lives together. Rental rates are set at welfare or 30 percent of income, and everyone, including Grandview Calvary members, will be paying rent. Johanna described the re-zoning meeting as a “great evening because we were able to talk about our vision.” More than 50 people spoke at the meeting, which ran until midnight. All but 15 were in favour. One presenter, a choir called Local Vocals, sang their support of the housing project. 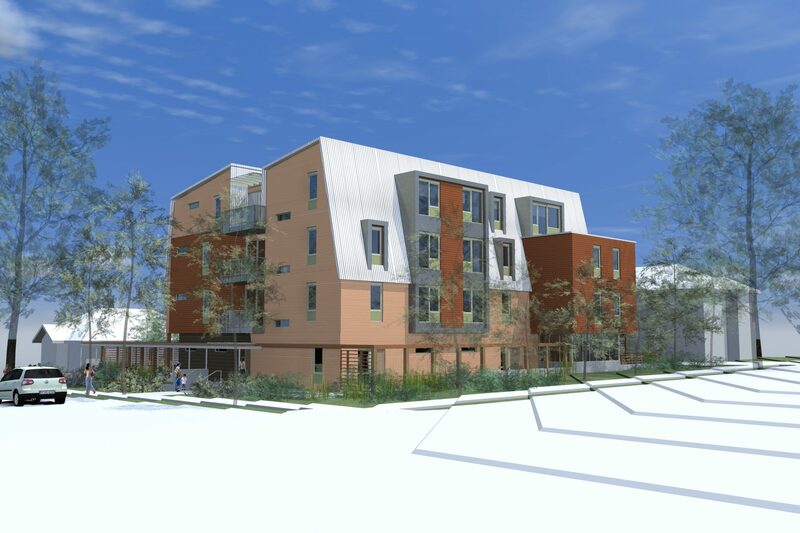 When the city council gave its unanimous approval two days later, they expressed their gratitude for the church’s leadership in working to address affordable housing issues and voiced the hope that this project could be a model for other churches. “What was really interesting is they started to use our language of inclusion and mutual transformation,” Johanna said. Creating affordable housing in exceptionally expensive Vancouver is the natural next step for Grandview Calvary, which has rooted itself in the community through its Co:Here Housing Initiative where church members live together and with guests intentionally in shared housing owned by the church. Some other initiatives that have grown out of Grandview Calvary Baptist Church and manifest the church’s presence in the community include Kinbrace, which provides housing for refugees; Crossroads Community Project, which runs a community kitchen; and JustWork, which provides work and job skills for people facing barriers to employment. With the zoning issue behind them, the next steps for Grandview Calvary and its partner Salsbury Community Society are to fulfill the conditions placed on the zoning application, such as making the design fit the neighbourhood a little bit better and then to get the development and building permits. They could start to build as early as the late fall. Before they build, however, they want to raise 100 percent of the project’s capital cost. They have already raised $4.8 million, including the church’s donation of the land, which is estimated at $1.5 million. Two other large donations, as well as many smaller ones, have brought the total raised so far to $4.8 million. That means $2 million more must be raised before starting the building phase. Johanna would like to encourage other churches to consider building affordable housing on parking lots or other unused property. Although such projects are expensive, “it is doable if churches have land, which is more than most affordable housing project have. Having land is not to be underestimated,” she says. She suggests that churches wishing to build affordable housing need two things in addition to land. First, they need “people in the church community who will hold onto the vision and keep coming back to it because it takes a very long time to make it a reality,” she says. Second, they need to connect with a development consultant who has experience seeing similar projects through, covering everything from managing budgets and timelines to understanding bylaws and building codes to knowing how to raise money for the project. You can find out more about Grandview Calvary Baptist at www.gcbchurch.ca or about its offshoot and ministry partner Salsbury Community Society at www.salsburycs.ca. Originally published in Making Connections, a Canadian Baptists of Western Canada newsletter.